Celebrate the enchanting world of Walt Disney with this beautiful seasonal ornament of Lumiere from the classic film, Beauty and the Beast. Designed by award winning artist and sculptor, Jim Shore for the Disney Traditions brand. This hanging ornament is made from resin. Unique variations should be expected as this product is hand painted. Packed in a branded gift box. 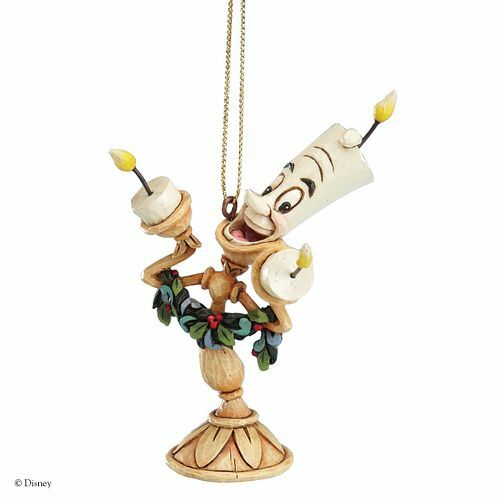 Disney Traditions Lumiere Hanging Ornament is rated 4.6 out of 5 by 5. Rated 5 out of 5 by Anonymous from Great Great Quality, worth each pound paid would buy again. Rated 5 out of 5 by Anonymous from This product is great The Cogsworth & Lumiere decorations are well made & will make a great addition to our Disney themed tree next year. Good price & posted very quickly.